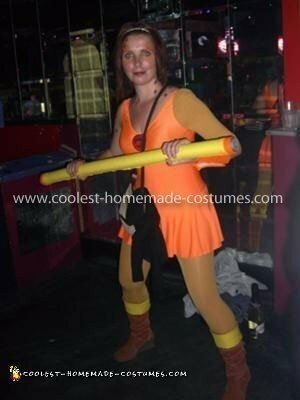 I made this Cheetara Thundercat Costume for an 80’s themed Fancy dress hen night. Most of the ladies wore typical neon tutu’s and 80’s wear but I wanted something a little different. All the costume to purchase on line were very unoriginal and not quite what I was looking for. As a child I remember watching Thundercats and so Cheetara was the obvious choice for me. 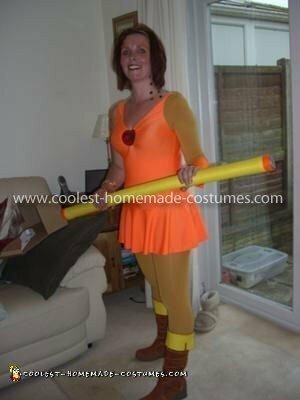 I adapted her slightly as there is no way I was brave enough to wear just a leotard so I purchased a skirted neon orange version complete with built in pants. The boots I purchased from Ebay and dyed orange and added the yellow felt cuffs. I brought two pairs of mustard tights. One for my legs and one to cover my left sleeve. I also made an arm cuff out of the same felt. The pole was foam piping insulation also covered in matching felt. To finish it off I sewed on the Thundercats logo and did the Cheetara make up. I thought the finished costume was awesome and hope you do to.